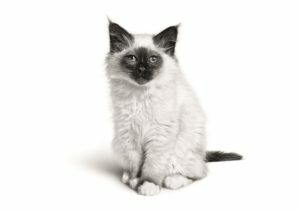 Hairballs or furballs can be unpleasant for cat and owner alike, but there are steps you can take to help prevent this from happening. When a cat grooms itself, this involves your cat licking its coat with its rough tongue. During this process, dead and loose hair can be swallowed. The majority of this fur will pass through your cat’s digestive system without issue. However, if this hair does begin to build up in your cat’s stomach then your cat will regurgitate it. The result is a hairball. It might seem strange that a cat grooms itself enough to cause this to happen. To give you some context, an adult indoor cat will spend about 30% of its waking time licking its coat. Consider a long haired breed doing this and hairballs start to become more understandable. We make a specific Hairball Care range of cat food. This food is specially formulated to help eliminate hair that your cat has swallowed. It does this by stimulating the cat’s intestinal transit and generally encouraging a healthy digestive system. Hopefully this answered your questions about hairballs and how to prevent them. However, if you have another question about hairballs, your cat’s health, or other facts about your feline friend then we’d like to help – sign up to our newsletter below.